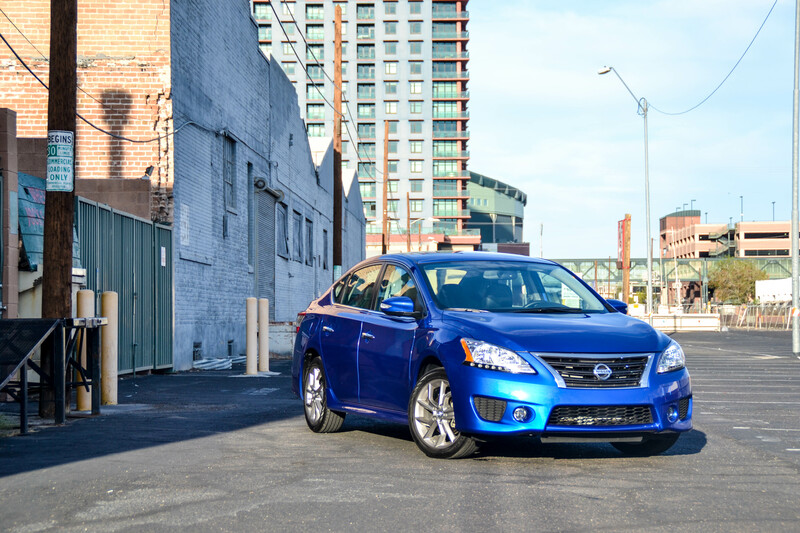 It’s hard to believe after two years into its seventh generation, Nissan is starting to make some subtle changes to the Sentra for 2015 by offering some new packages and minor mechanical tweaks. These new changes are to hopefully entice some new buyers who want the Altima luxury features, without the Altima price tag. Much like the one we drove back in 2013, our sampled Nissan Sentra is the sportier $19,910 SR which is two tiers above the base S and SV, but one step below the premium SL. It even arrived in the same exuberant Blue Metallic paint making every day driving a bit more festive. Unchanged for 2015 is the same, but dreary 1.8-liter four-cylinder engine that produces 130-horsepower through a Continuous Variable Transmission, CVT for short. A six-speed manual is an available option, but only for those that seek the pure base S trim. In terms of acceleration, it’s best to ignore the sport button on the dash as, it doesn’t increase its chances to 60 mph in anything less than double digits. For 2015 Nissan has introduce what’s called a “D-Step Shift Logic.” This basically takes the CVT and mimics a traditional six-speed automatic which adds some familiarity into its driving dynamics. In retrospect, you won’t be able to out run any wild goons chasing you through the streets of downtown, but at least the Sentra entertains you while trying to out maneuver them. Surprisingly the chassis feels tight and orderly. The steering is a bit vague and their isn’t much road feel, but its pretty nimble. And at the slightest hint of taking a turn too aggressive, you’ll get some humble tire squeal hinting you’re pushing the limits of all she’s got. At least rolling on 17-inch wheels, the Sentra has a nice, supple ride quality that makes day-to-day driving enjoyable. If you’re looking at fuel economy, that’s exactly what Nissan ordered. The Sentra is capable of producing 29 mpg city and 39 mpg highway on regular fuel. During our week we managed to pull out 31 mpg combined with about 345 miles of range. There is an Eco button to help sip fuel, but we wouldn’t recommend making the Sentra worse. The biggest change here for 2015 is the packaging. By offering a $2230 Premium Package, our sampled Sentra was upgraded with the finer things in life like black leather interior, Sunroof, Bose Audio, and an Auto-Dimming Rear View Mirror with HomeLink. With the addition of this package, the SR has a more first-class appeal without having to spring for the unenthusiastic SL which only then gets you dual-zone climate control. Also featured on our Sentra but not necessarily a new package was the $720 Navigation Package. In this advance world of technology, it almost seems like a useless system, especially when you can get better quality maps via your smartphone, but at $720, it’s a bargain. The system itself is a bit odd, the Nav feels like it’s from the early millennium, but the backup camera is good and has the capability of reading out text messages. As a compact sedan, the Sentra does have a ton of perks to it, even with this mid-level SR trim. The look is appealing and has all the right gizmo’s to attract young buyers like LED accent lights and LED tail lights. Those 17-inch smoked wheels are groovy and this SR gives the Sentra a much sportier attitude than just a regular boring sedan. Added for 2015 does bring in LED indicated side mirrors which used to be only available on the higher SL. With the added Premium Package, the Sentra is a nice place to be. The interior is comfortable, the seat setting is supportive and there is tons of room for rear passengers. With or without the leather, the seats here do come manual only but come standard with a heated feature. Everything here is driver friendly, the steering wheel controls have a nice layout and the radio controls are well within reach. We even like the dash design – its simplistic, yet stylish using decorative silver trim. Plus the Sentra comes with Smart Key Technology which means you just push a button and go. The Nissan Sentra is one of those cars that at the end you say “it’s a nice car” because you really can’t think of anything else to say. After all it is handsome, especially in blue, has a nice interior, and will get you from point A to point B. At an as tested price of $23,865 you do end up with a lot of car for your money, especially when the base model Altima starts around the same price.